It’s been a long time coming but we have finally gotten around to writing up our first PSP game. We bought this together about four months ago and it has taken some time before we got around to writing up one of the games. It doesn’t help that many of the games that we got for it are puzzles and we have only just gotten past the point of needing to write one up. If you can cast your minds back about a year ago when we played Meteos I made a mention of how much I was looking forward to play this music-puzzle-mindmelting game with giant lips that flash on the screen to distract you… I wish that last one was not so scary. This game clearly can’t be anything but a puzzle game, with its dropping of blocks, although the influence of music on this game is undeniable. As I was playing this game on my/our snazzy new second-hand PSP I could not stop thinking of the Kinect game Child of Eden which attempted to create the feeling of synesthesia. Whilst you are moving the colourful blocks into a position where you can create squares, which explode in a colourful fashion, your moves directly affect the sampling in the music. 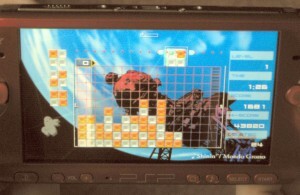 Each level features different music, a colour change and a new level of distracting background visuals. All of these really blend together in an audovisual mix that can get stuck in your head and, while not directly affecting gameplay (other than its distractions) do become part of the experience of the game. If you play this game for a very long time you are very likely to get a headache since it can get a tad overwhelming with all the flashing music and repetitive club-style music. In 20-30 minute stretches though it works a treat. Add to this that, despite being addictive, the game also gets fairly repetitive, making a single game a treat, but the difficulty of setting up the combinations to empty the game when it gets larger gets tiring – it feels like enough after a longer game of fifteen to twenty minutes. Yet you will find yourself coming back to it quite soon after to try and beat your previous score. There is also a rather nifty puzzle mode which is a great way to bide your time until you feel up to tackling the marathon single-player again. Where nifty in part means difficult, as you have to use randomly created blocks to create a figure, starting with some basic forms, working up to such things as dogs and giraffes. It is not necessarily difficult per se but it does require a lot of planning a few bricks ahead. Tetris and chess masters are likely to find it a doddle… the rest of us just get angry when we are unable to make an infinity symbol out of the squares. On a whole, the puzzle itself is fairly simple – drop blocks and arrange them into larger squares, to be destroyed when the beat reaches you. That doesn’t describe the rest of the experience though, which adds in music and visuals to create an experience that transcends the gameplay in the game. It’s a simple premise which has been placed in an environment that can make it rather challenging. We have not heard the last of Lumines since it will be back sometime soon with it’s semi-sequel Lumines Live. How is it any different? We’ll find out one day.